I had no plans to go Coffeeneuring on Saturday. 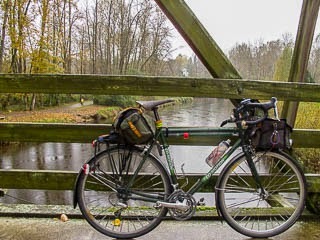 Instead, I planned to take part in group 300K ride from Bremerton to Seattle. The ride started at 7:00am in Bremerton, which required taking the 6:00am ferry from Seattle. I arrived in Seattle about 5:15am with (I thought) plenty of time to park, prepare the bike, and board. Street parking is limited to 2 or 4 hours Monday-Saturday. The surface lots I checked had automated ticket machines, each with a 10 hour limit (I needed closer to 20 hours). The garages I checked were all closed. 30 minutes later, still unable to find long-term parking, I gave up and went home. Since I didn't spend 15 hours riding a 300K, I had plenty of time for some coffeeneuring. 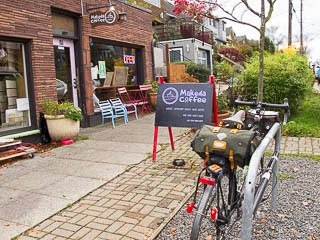 Saturday's ride followed a familiar pattern: Kasia shopped at Sky Nursery while I rode to an old familiar place, Makeda Coffee, for one of their signature drinks: a Humpty Hump! 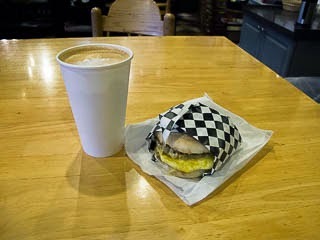 A Humpty Hump consists of a macchiato and an americano. The macchiato is delicious, but rather small and finished all too quickly. However, by the time the macchiato is finished the americano has cooled enough to be comfortably savored. It's a great combination. The slice of squash bread only added to the experience. 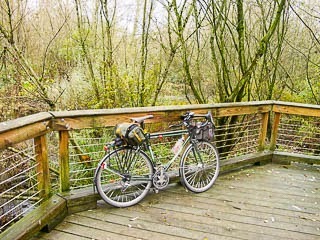 Afterwards, I slowly rode back to Sky Nursery on the Interurban Trail. Near Sky, there is a small section of red brick that looks like an old cobblestone road. 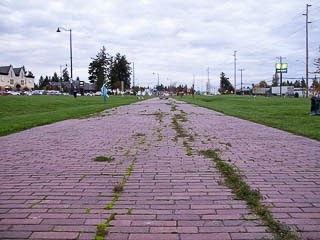 I suspect this is another small piece of the old Red Brick Road that stretched from Bothell to Everett. 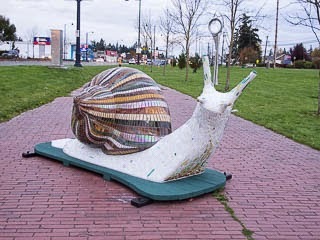 The section near the trail is maybe 100 yards long and adorned with large art pieces. 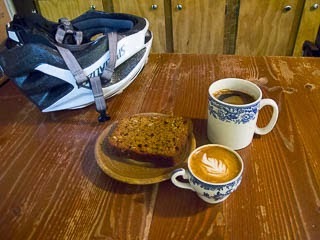 For Sunday's coffeeneuring ride I tried a completely new (to me) place: The Den Coffeehouse in Bothell, WA. The day was grey, dreary, and a little rainy -- perfect coffee weather! I had time to spare, so I took the scenic route to The Den, lingered over my latte and fantastic breakfast sandwich, then slowly rode back to town. I even managed to snap a couple of photographs for the "Look At My Bike Leaning Against Stuff" group on Facebook. Six down, only one to go!